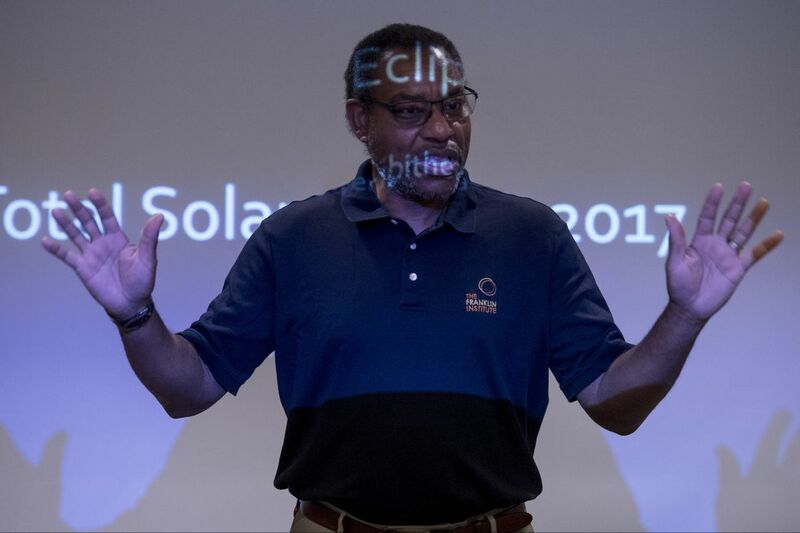 Franklin Institute chief astronomer Derrick Pitts creates a mini eclipse — by standing between the projector and the screen — as he leads a workshop on how to safely view the upcoming solar eclipse. Monday, Aug. 21, 2017, is the date astronomy enthusiasts have been waiting for: A solar eclipse visible for a wide swath of the United States. Here in Philadelphia, we can expect a partial eclipse, with about 75 percent of the sun obscured by the moon. Ready to answer all your questions on the big day is Franklin Institute astronomer Derrick Pitts. Pitts will be in Saint Joseph, Mo., which is in the 70-mile-wide path slated to get a full eclipse. Pitts, the Franklin Institute's chief astronomer and planetarium director, will be taking your questions live on Philly.com's Facebook page at 3 p.m. on Monday. That's shortly after the eclipse hits its peak in Philadelphia, which will happen at 2:44 p.m.
For those interested in seeing video of the eclipse, you'll be able to watch a stream from NASA here on Philly.com. The Franklin Institute will share live video from Pitts in Missouri during the height of the eclipse there, from 2:06 to 2:09 p.m., on its Facebook page. He's a North Philadelphia native. Pitts has been at the Parkway institution since 1978. He is a NASA solar system ambassador and outreach adviser to the world's largest telescope, the Thirty-Meter-Telescope at Mauna Kea in Hawaii. He regularly appears on television and in other media outlets, ranging from Comedy Central to CBS as a science expert. You can find him on Twitter at @CoolAstronomer. What happens to the grid when solar power goes dark during the eclipse?